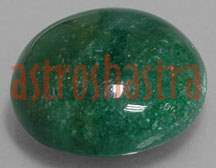 Aventurine gemstone is worn to attract moneymaking oppourunities. It is mainly quartz, a quartzite, usually containing mica. It occurs in several colors including green, red and blue. This metallic green stone helps you take advantage of opportunities that come your way. Because it heightens your perception, it is used to bring good luck in games of chance or when making investments. You should never buy a lottery ticket without an aventurine in your left pocket. Lady Luck will be in your left pocket. This is the stone of opportunity. It is known as the stone of chance or luck. If you gamble or play the lotto, keep this stone in your left pocket. Blue coloured is an Aries stone that opens the Third eye chakra. It is a powerful mental healer that increases vitality and a positive outlook. This stone assists in self-discipline and developing inner strength. Yellow coloured opens the Third eye chakra. It is often used to balance emotions and male/female energies. Red coloured opens the Root chakra. It can assist in creativity, and help you to see the possibilities in new opportunities. It is used to aid nearsightedness. It has a stabilizing effect on the emotions. It is excellent for teenagers. Astroshastra has made an excellent combination of this gemstone with Twelve mukhi rudraksha , which not only increase the confidence of the wearer but also strengthen the inner will power to acheive the desired. It opens the door of new opportunities and wearer goes ahead with their plans and acheive success.